After some market research, Land Rover found out that about 50% of their owners had dogs -- not surprising if you've ever been to a Land Rover event. To help this substantial market make their Land Rovers more dog-friendly, they've announced a selection of "Pet Packs" in their accessory catalog, promoted by new canine mascots Landy and Rover. The new packs include the "Pet Load Space Protection Pack," which includes a quilted load space liner, full-height luggage partition and spill-resistant water bowl; the "Pet Transportation Pack" with foldable pet carrier, spill-resistant water bowl and load space rubber mat; and the "Pet Care and Access Pack" with full-height luggage partition, quilted load space liner, pet access ramp and portable rinse system. Where appropriate, the items are custom-sized to fit the various new Land Rover models. The luggage partitions and rubber mats have been mainstays of the Land Rover accessory catalog for years. But the new quilted liner adds another plush layer to the floor and protects the bumper when dogs enter and exit the vehicle. The folding pet carrier seems like a useful item, and the water bowl could be just as useful at home for the seriously die-hard Land Rover owner. 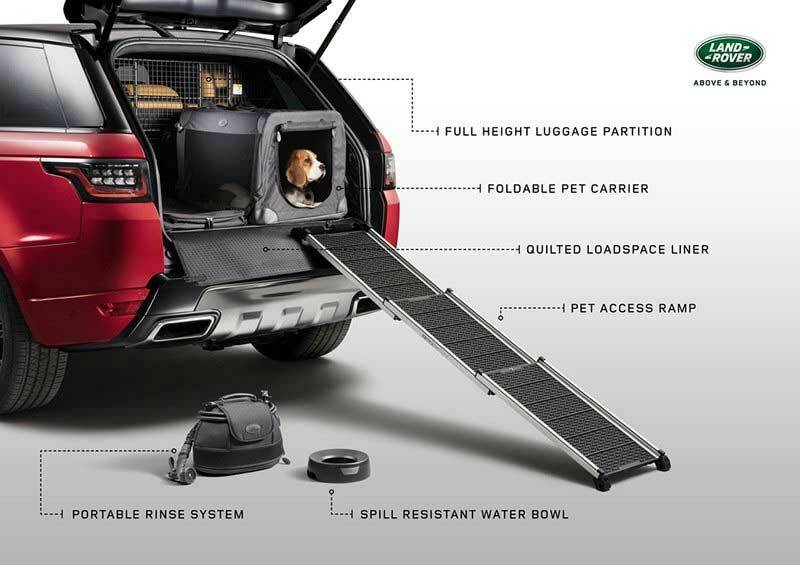 Maybe the most interesting items are the folding ramp, which allows dogs who weigh up to 187 pounds to walk right into the cargo area, and the portable rinse center, which is a 1.7-gallon tank which can provide a 5-minute flow of water through what is effectively a standard garden hose sprayer. It looks like it could also do great double-duty for that half of Land Rover owners without dogs who can find a myriad of uses for it off-roading and camping. Landy and Rover are promoting the Pet Packs in a series of online videos and photos, showing how the items are just as useful for large and small dogs. 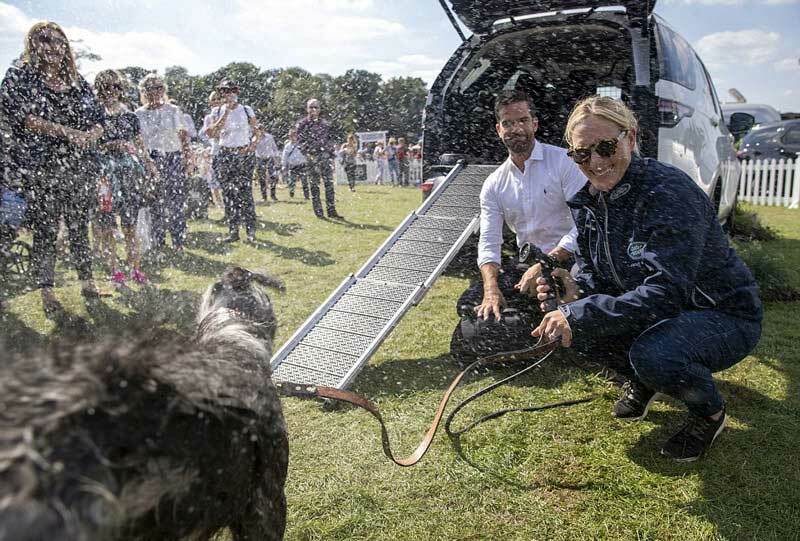 The new Pet Packs even already have their first high-profile fan: Royal Family member and longtime Land Rover brand ambassador Zara Tindall, the daughter of Anne, Princess Royal, who demonstrated some of the items at the Land Rover Burghley Horse Trials in Stamford, Lincolnshire, England.